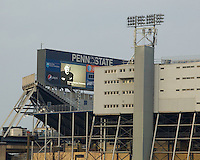 In the first few days following the passing of Joe Paterno, the lights were turned on at Beaver Stadium and left on during the period of mourning. The lights, combined with a low cloud ceiling created a stunning and powerful image that could be seen from many vantage points around the State College area. Here are a few images that I captured during those days. I have received so many requests for prints of these images, that it seemed a good time to make them available. I will donate a portion of the purchase price for any of these prints to the Penn State Dance Marathon (THON).